There are different accessories that can lend sparkle to your outfit. One of these accessories are Crystal Jewelry necklaces that you can find in department stores, specialty stores and also in online stores. Below are some of the pieces that one can find in the market nowadays. Most of these can be found in the Swarovski website. Let start with the necklace that combines the birthstones of April and May, from the 4mm Swarovski�s Crystal AB with Jet Sterling faceted droplets of Swarovski Emerald stones for about a length of 21 inches round. This can cost you only $65. A 16 inches long Sterling Silver necklace cascades with 4mm and 6mm Swarovski Clear Crystals faceted with 11mm Teardrops Crystals also sells for only $89. It is named Icicle Swarovski Crystal Necklace. Next in line is the $65 Sterling Silver necklace, which is wire wrapped with a Swarovski Crystal that hangs with a handmade Sterling Silver Scrolls. At the end, there sits a Swarovski Crystal Teardrop. You can change the color of each crystal, depending on the motif of occasion. They call this Cluster Teardrop Necklace. Another must-see accessory is the Crystal Pearl and Clear Teardrop Necklace, which is a bridal necklace designed with 6mm Clear Swarovski Crystals, 4mm Swarovski Crystal Pearls and 13mm Clear Swarovski Crystal Teardrops. It sells for $142. This bridal necklace can reach about 13.5 inches long and like the previous necklace, you can change the crystal colors depending on the motif of the occasion and the color of your gown or dress. Another great piece is the elegant 15 inches long pearl necklace that is strung with 4mm White Freshwater Pearls and center drop for about 3 inches long of Sterling Silver. This elegant necklace is priced at only $76. It is named Waterfall Pearl Y Necklace for its design. The Champagne and Cream Bridal Lariat Necklace is made with a design that is strung with 4mm Swarovski Crystals alternatively holed with 4mm Light Colorado Topaz and 6mm Clear Crystals. At the end is a lariat loop while the other end had a 13mm Swarovski Clear Teardrop. It only costs $85. Another bridal necklace that is only about $87 is Champagne and Cream Clover Bridal Necklace, which is rounded with 15 inches long and a center drop for about 2 inches. This necklace has Champagne and Cream Swarovski Pearls, Light Colorado Topaz and a Clear Swarovski Crystals. Also a low-budget bridal necklace is called the Timeless White Pearl Bridal Necklace, which sells for only $50. It has a potato-shaped 4mm White Freshwater pearls. Next in line is the Simple Pearl Y Necklace that is strung with 4mm White Freshwater pearls and a center drop of potato shape Freshwater pearls. At the end of the drop is a larger oval pearl that sells for about $70. Another bridal necklace is called the Butterfly Drop Bridal Necklace also in market for only $70. It is strung with White Pearl Butterfly shape Freshwater pearls and 4mm Clear Swarovski Crystals which is about 15 inches long. All the above mentioned necklaces are now available at your nearest crystal jewelry shops especially if they are exclusive distributors of Swarovski Corporation�s crystal stones. You can also check some of the online jewelry stores. They will even have more selections that you would want to have. 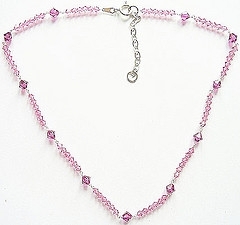 This entry was posted in Crystal Glitz and tagged crystal jewelry on February 25, 2010 by admin.